Join us at our 45th anniversary Geranium Day in Somerset. 2019 Geranium Day download Booking Form. We are still the only association dedicated solely to this large family of garden-worthy plants, which have been voted the Hardy Plant Society’s favourite flowers. Our members provide advice and information about the plants to gardeners, nurserymen and journalists in the UK and abroad. Membership is open to all members of the HPS and we welcome those who are not specialists but would like to know more. The Group organises a geranium and erodium seed exchange. Seed should be sent in by Nov 1st. The seed list is available at the end of November and details are published in the Autumn newsletter. The list is sent out to all members. 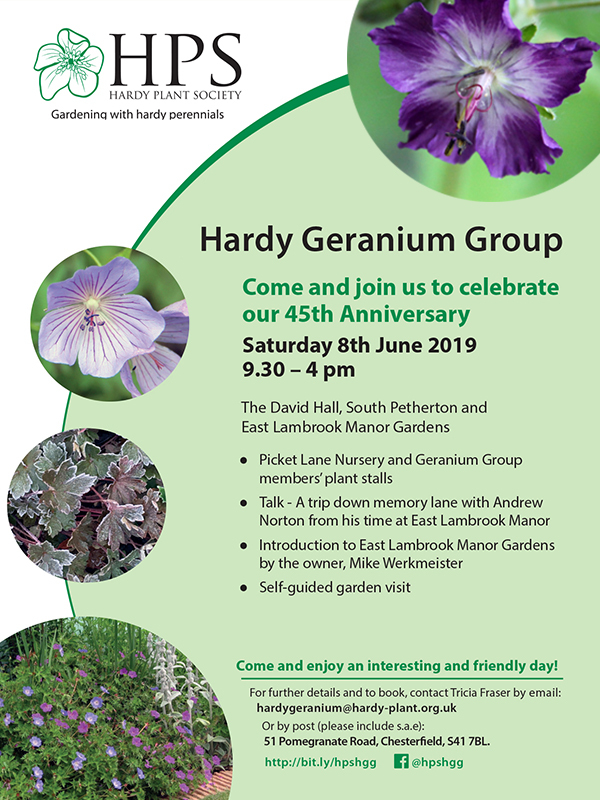 2019 will be our 45th anniversary and to celebrate we are holding our annual Geranium Study Day on Saturday 8th June at East Lambrook Manor. Margery Fish lived there and was well known for her love of hardy geraniums and it seemed fitting to visit her garden on our special day. In the morning we will be meeting in The David Hall in South Petherton for our AGM and we are delighted that Andrew and Dodo Norton have kindly agreed to join us and Andrew will talk to us about their time at East Lambrook Manor. After this Mike Werkmeister will welcome us to the garden at East Lambrook and give a short, introductory talk on how the garden has evolved, before we meander round the garden and nursery at our leisure. Many of you may have already visited East Lambrook Manor but we do hope you will consider joining us on this celebratory day. Further details and booking form now available. The cost, which includes entry to East Lambrook Manor Gardens, is £10 for Hardy Geranium Group members, £15 for HPS members (includes Hardy Geranium Group membership to end 2019) and £15 for the public. Members arriving at our 2018 geranium day were greeted by a long table full of hardy geraniums on sale, many of which are hard to find. Our members often keep the less common cultivars going when nurseries give up on them and there was a brisk trade at the sales table during the day. Margaret Stone, our chairman for 10 years, stood down at the AGM and Tricia Newton, a former committee member, volunteered to take over the reins. Margaret was presented with a watercolour of Geranium macrorrhizum ‘Bevan’s Variety’ as a token of the group’s appreciation for her hard work in running the group and organizing many of our geranium days. Hardy geraniums seem to be less fashionable now than they used to be but this group is still the main source of information on Hardy Geraniums in the UK and is uniquely able to educate and inform the general public, and probably able to answer questions better than any other similar group. Margaret also gave a talk on “Garden Worthy Geraniums”, giving us lots of ideas and recommendations about which varieties are likely to do well, based on her many years’ experience of growing them in Worcestershire. The garden visits were to Barry Street's garden and allotment, followed by a visit to the Plant Specialist nursery in Great Missenden. Barry has a typical-sized suburban garden which is packed with plants including many interesting geraniums, peonies and hostas. The Plant Specialist nursery was also excellent with a garden area at the top of the nursery (all plants being well labelled) and a large well-stocked nursery area, providing more buying opportunities. A beautiful June morning saw Hardy Geranium Group members converging on the Village Hall at Norwell in north Nottinghamshire, for many a little known corner of the East Midlands that is worth getting to know. This was Geranium Day. Thirty or more members and friends met for, in the first place, the Group’s AGM, which went as AGMs do. Andrew Ward, the owner of Norwell Nursery then gave our “keynote speech”, talking about the very various forms and colours which different geraniums take. He illustrated it with an amazing series of photographs taken by himself, alongside a very entertaining and informative commentary. After a coffee break and discussion, we all raided the plant stalls which were again well stocked. I doubt if anyone came away empty handed. By now it was time for a picnic lunch and it was also extremely hot so we were grateful for Andrew’s offer of shade in his garden. After lunch he spoke again about a selection of his nursery stock (not all geraniums) and set us free to wander and explore either with his guidance or independently. This was most rewarding: there were interesting things in the garden as well as in the sale stock. I was pleased to come across an erigeron I had been on the lookout for. Best of all, perhaps, were the poly tunnels, the best kind of jungle where you might discover all sorts of interesting treasures and pleasant surprises. All was topped off with tea and cake before we left for home after a full and enjoyable day. Subscriptions are renewable on 1st January. The subscription of a member joining after 1st October is valid until the end of the following year. U.K. members: £5.00 p.a. This covers up to two people at the same address. Please note that this is in addition to the National HPS subscription. Overseas members: £7.00 p.a. to be paid with the main HPS subscription unless members have a UK sterling bank account. Full details on how to join are on our membership form. Open by appointment in 2019. Please email for details. From Nantwich town centre follow A530 towards Whitchurch. At Sound School on R take 1st R onto Wrenbury Heath Rd. Margaret Stone, Brockamin, Old Hills, Callow End, Worcs. WR2 4TQ. Geranium x cantabrigiense, macrorrhizum and sanguineum. ½ mile S of village. Pull into Old Hills car-park; walk towards houses, keeping right. Take A3090 to Romsey. At top of hill take left turn into Gardeners Lane.